Turn over your iPhone and you'll see that it's "assembled in China." But that doesn’t mean that most of the profits or revenue go there. 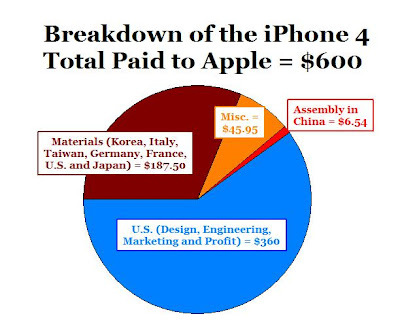 In fact, only about $6.54 (a little more than than 1%) of the full $600 retail price of an iPhone goes to China and more than 60% goes directly to Apple and other American companies and then indirectly to American workers (see chart above), according to a recent "teardown report" by iSuppli that was featured in a New York Times article yesterday. "...designed by Apple engineers in the United States, sourced with high-tech components from around the world and assembled in China. Shipped back to the United States, the iPhone is priced at $600, though the cost to consumers is less, subsidized by AT&T in exchange for service contracts. “China makes very little money on these things,” said Jason Dedrick, a professor at Syracuse University and an author of several studies of Apple’s supply chain. Much of the value in high-end products is captured at the beginning and end of the process, by the brand and the distributors and retailers. According to the latest teardown report compiled by iSuppli, a market research firm in El Segundo, Calif., the bulk of what Apple pays for the iPhone 4’s parts goes to its chip suppliers, like Samsung and Broadcom, which supply crucial components, like processors and the device’s flash-memory chip. The total bill of materials on a $600 iPhone — the supplies that go into final assembly — is $187.50, according to iSuppli (see chart above). The least expensive part of the process is manufacturing and assembly. And that often takes place here in southern China, where workers are paid less than a dollar an hour to solder, assemble and package products for the world’s best-known brands. 1. We often assume that "assembled in China" means that 100% of the product's content and value is produced or "captured" in China, when in this case only 1% of the iPhone's value is produced by China, and more than 60% of the iPhone's retail value is produced by American engineers, designers, and other IT professionals at Apple, and also at other U.S. companies like Intel and Texas Instruments that provide some of the components. 2. Assuming the U.S. government counts an iPhone as a $600 import from China (or some lower wholesale value) and increases the trade deficit with China by $600 - even though China contributes only about 1% to the final value - our $227 billion trade deficit with China could be significantly overstated. 3. The article also points out that labor costs are starting to rise in China's "dominant electronics manufacturing center in Shenzhen toward lower-cost regions farther west, even deep in China’s mountainous interior." In other words, China's workers are receiving significant benefits from globalization and trade with the United States - "buy an iPhone in the U.S. and you're helping a worker China get higher wages or a bonus." I thought trade, globalization and capitalism were supposed to produce bad outcomes for workers, who get exploited by greedy employers? 4. At least in the case of the iPhone, a strengthening Chinese currency or rising inflation or wages in China wouldn't have much effect on the retail price here, since the cost of assembly is so insignificant to start with - $6.54 per $600 unit. Further, production will shift towards lower-cost regions of China as the article mentions, or production will shift out of China to Vietnam and other markets with lower wages. "The real value of the iPhone doesn't lie in its parts or even in putting those parts together. The bulk of the iPhone's value is in the conception and design of the iPhone. That is why Apple gets $360 for each of these iPhones it sells, which is by far the largest piece of value added in the entire supply chain. Those clever folks at Apple figured out how to combine hundreds of mostly generic parts into a valuable product. They may not make the iPhone, but they created it. In the end, that's what really matters." This is what the NY Times meant when it said that "Much of the value in high-end products is captured at the beginning and end of the process," in this case by Apple and its distributors and retailers. HT: Colin Grabow for the NY Times article link. This is fascinating. Thanks, Mark! Nice. This is always one of my comparative advantage examples. Was that Assembled in China or Apple IPhone 4g cloned in China? There is the comparative adavantage in the present time! Clearly, the highest value work is done here, therefore the largest percentage of profits end up here. This is a great example of good allocation of resources. If Apple were more vertically integrated, the cost of the iPhone would be considerably higher. However, we shouldn't concede the $194 of component/assembly costs so quickly. Although these are supposedly generic or commodity parts, money is money, And (very) likely 90% the component, and all of the meager assembly, cost flows out of the country. I'm not railing against the global economy here. Oddly enough, i believe without low cost manufacture, it is very likely that products such as the iPhone wouldn't even make it off the napkin. I'm just providing a different view. And I believe there has to be, and we must consider and should work to find, a way to employ more Americans in the production of devices such as these. Sure, and that is why China will soon pass the US as the world's largest economy. They are already the world's largest manufacturing economy. Mainland Chinese have stopped migrating to the U.S.--they see a better future there. The Far East is the future of the world--but we may have a few guys sitting around designing toys and gadgets. Good luck with that. People in Silicon Valley, and other high-tech areas throughout the U.S., basically invent products most people can't imagine and improve them. These are "service jobs." The U.S. can produce goods other countries can't. That's why the U.S. leads not only the world, but the rest of the world combined (in both revenues and profits) in the Information and Biotech revolutions. China, similar to India, promotes obedience rather than creativity. That may explain why China has no competitive brands (in any industry) on the world market. Even in Europe, there are no Microsofts, Apples, Intels, Googles, etc. Quote from Jason: "And (very) likely 90% the component, and all of the meager assembly, cost flows out of the country." But "the country" doesn't own Apple. The stockholders of Apple own Apple. Maybe if you don't like how Apple does business, you should buy it and change it. This is an example of the fundamental weakness of our economic system. We make policy on the basis of what is good for corporations rather than what is good for the country as a whole. No doubt about it free trade/outsourcing promotes profits at apple. In a recent article Andy Grove of Intel points out the fallacy of this intellectual work here manufacturing work there model. He notes that Apple employs about 25,000 people here. He then points out the China’s Foxconn employs 250,000 to make Apple’s products. Before we had free trade, which was for most of our history, all 275,000 jobs would have gone to Americans. Now for ever American job created by Apple’s innovation 10 jobs are created outside the US. When Henry Ford when to get financing for his first factory his backers would not have suggested building that factory outside the US because the tariffs would have made it unprofitable. Today they would not give him money to build a US plant. Consider the example of Toyota. All the jobs Japan gets from Toyota are a direct result of trade protection. Toyota started out as Toyoda Automatic Loom a manufacturer of textile machinery. At the time Japan’s biggest export was silk. They moved into car production in 1933. Their product was very poorly made. Had Japan followed free trader theory they would have purchased from the most efficient producers GM and Ford which were operating in Japan at the time. Instead Japan chose to protect their industry. In 1939 Japan kicked GM and Ford out. After the war they protected Toyota and the government gave them money. In 1958, after 25 years of trying to make a decent car, Toyota exported their first car to the US. It was a piece of junk called the Toyopet. It failed. Convinced that industry was more important than silk, Japan kept on protecting Toyota until they got it right. We on the other hand exposed GM, Ford, and the rest to the products of cheap foreign labor. Who won? If the world had followed free trade theory, today Ford, Chrysler, and General Motors, along with free trade victims Studebaker, Nash, Hudson, and Willys would be car makers to the world. Instead they are weak high cost competitors nearly out of business. We blindly stick to free trade while the rest of the world protects. @ anonymous 7:44: Though it is certain that Japan and Toyota is a great example of corporate/government, tariffs and protectionism is not the answer. As an engineer in the auto industry I cannot refute that foreign competition has dramatically improved the quality and reliability of all vehicles sold in America. I know this would not have happened without Toyota having their way with GM's market share. I think we need to look hard at why companies cannot flourish in this global economy, identify the barriers, then obliterate the barriers, where possible. For instance, GM would have been a much more formidable competitor if not for terrible union contracts, oppressive pension and medical costs and bad demographics (plants located in the east and north when population was expanding south and west). Sure GM would still have the Aztek, but having free cash helps anyone. "We blindly stick to free trade while the rest of the world protects." My one experience with a new American vehicle was a '96 GMC truck piece of sh*t. After the warranty ran out it started breaking down, bleeding my bank account and time spent getting it fixed. a bunch of union workers can protect their junk making jobs. you seem to be have some misconceptions about the role of corporations. their role is to create profit for investors, not jobs for the public. the corporation is one of the most successful inventions of all time. it allows the pooling of risk capital to create businesses. it's creation caused an explosion in economic growth rates by reducing the risk of investment by preventing a corporate failure from bankrupting it's backers. in a free country, corporations are not a tool of government to promote social ends (like job growth). a system in which the government views them as such is called fascism. we have seen numerous examples of the failure of such doctrines in italy, weimar, and the former soviet union and its satellites. if you milk the profit out of corporations by forcing them to create more jobs than are warranted, investment and growth drop. long term, that leads to more unemployment that you had before. it's a classic example of a short term fix making the problem worse in the long run. by hamstringing our own business, you just shift investment overseas, more so now than ever. to prevent that, you would need the sort of ruinous capital controls that would utterly sink us and isolate the US from the world economy. i read grove's piece as well, and he has really gotten this one wrong. he is making a very self interested argument to favor intel over it's peers. levying a tax on foreign production is NOT the way to go. we will all be worse off for it. no one wins trade wars. the correct response is to break down the US barriers to production: lower our taxes, streamline healthcare, make business and environmental regulations less onerous or at least more understandable and simplify the process of compliance. no one in their right mind builds semi plants in CA anymore because the electricity is too expensive and the enviro regs draconian. intel gets away with things no one else can because they are virtually a monopolist. they also have an unusual situation where their trade secrets are so important that they fear being offshore. his solutions are not going to work broadly. instead, they encourage making the same mistakes we are currently making by coddling industry from the world. grove also completely misses a key issue of trade offs. environment is a luxury good. the wealthy choose to consume it. if we allowed plants to dump crap into the air and water we could retain much more industry. choosing a clean living environment over this is a choice made (quite rationally) by wealthy nations who can afford to. yes, it hampers our production and one can certainly debate what the correct level is and whether we have gone too far, but would you want to live in air and water like shanghai? putting up the kind of tariff barriers he discusses will just make US products uncompetitive. might not be a big deal for intel who has little real competition, but it would be death for guys like micron and cisco. it would also put just the kind of pressure on PC makers that intel wants and box out future foreign competition for them in microprocessors, which is their greatest fear. it would also likely allow them to re enter several memory markets (like *RAM) and defend flash, industries with thin margins that have gone overseas. that was a very self interested piece written to lobby for intel than out of public spirit. Annonymous @7:44 said "He notes that Apple employs about 25,000 people here. He then points out the China’s Foxconn employs 250,000 to make Apple’s products. Before we had free trade, which was for most of our history, all 275,000 jobs would have gone to Americans. Now for ever American job created by Apple’s innovation 10 jobs are created outside the US." 1. Not all 250,000 jobs create Apple products. 2. There are two sides to the equation. How much would an iPhone cost if Made in the USA was stamped on it? $800, $1200, $3000? Even if it was only $200 more then less would be sold. That cuts your 250k jobs number more. It would also cut Apple's profits, so you'd be cutting into those 25k high paying American jobs as well. If you pay more for your iPhone then you have less money to spend on other goods and services, which destroys American jobs elsewhere. Liberal pundits always leave out this side of the equation. You can either have cheap goods providing a high standard of living, or, you can high paying jobs and not be able to afford as much. If liberals have their protectionist ways then they'd complain about the high inflation rate and low standard of living. Complain, complain, complain, complain. That's all the stone agers do. Benjamin said "and that is why China will soon pass the US as the world's largest economy. They are already the world's largest manufacturing economy." 1. Wrong. The US is the world's largest manufacturer. 2. China has over a billion people. What do you expect? Do you prefer those poor folks remain poor by manufacturing less per capita than the US does? Your comments sound pretty heartless toward some of the poorest people on this planet. Sigli, you are correct on all of your points. I would add we should (need to) find a way to make the iPhone in the United States with a sales price of $600. One of the point you touch on is liberals and their complaints. This behavior of liberals is a PRIMARY reason why jobs have fled the US over the last several decades. A liberal will take low value work and use thuggery to make companies pay a high value wage for it. The greatest example of this is, again, the automotive industry. Walther Reuther was well known in his efforts to match blue collar pay with white collar pay. Well he won that battle, and lost the war. After he declared victory in 1970, the UAW has shrunk to a fraction of it's former size. Nonetheless, have to acknowledge, quickly, that low paying jobs are better than government subsidies. Otherwise we may be on the verge of the unemployed angry masses revolting. anon..."China’s Foxconn employs 250,000 to make Apple’s products. Before we had free trade, which was for most of our history, all 275,000 jobs would have gone to Americans"
I don't think all these Foxconn employees are making Apple products..but however many of them are, if the same number were employed to make the products in the U.S., the prices would be so high as to make the products unmarketable in volume. With higher labor costs, there would of course be much more productivity to invest in productivity improvements. So maybe the $45 assembly cost would turn into $90, while the total assembly employment would be much less than it is in China. Several comments suggest that if Apple made the product here their labor costs would be higher and therefore the price would be higher. Not according to both my b-school economics professor and my b-school marketing professor. The econ professor says the price should reflect demand and cost tells the firm whether or not they should be in the business of making the product. The marketing guy would say if the market would pay a higher price Apple should ask the higher price and thus increase profits. In fact my marketing professor said the people deciding the price should not even know the product cost. Price should be set to clear the market and that is not a function of cost. Suppose a grain belt county increases property taxes. When farmers in the county put their corn up for auction in Chicago there is no way for the price they get for the corn to reflect the higher costs due to the tax increase. Buyers do not care. The market, not the cost, sets the price. When I compare the price GM/Ford cars made here with those made in Mexico and Canada it looks like GM/Ford are following this policy. Car for car I see no consumer price reduction based on the lower labor cost. you have a much too simplistic view of what i suspect your professors were saying. demand, as i'm sure you realize is a function of price. you set price to maximize overall profit, not revenue. you need to know the cost to produce and take it into account. so, it's not a question of "could i sell more units at X price". it's where does ((unit revenue - unit cost) X units) maximize. so, setting price without knowing cost is insane. how can you know if that's optimal profits? to think purely in terms of revenue is the .com bubble based thinking that ruined so many companies. sell iphones for $20 and you could sell one to everyone in america, but you'd lose your shirt. you need to know that. selling even one at above cost is better that selling a million and losing $20 a handset. so, yes, if that is the entirety of what your b school professors said, they are wrong and you ought to go ask for your money back. further, your grain tax example is both flawed and counter to observed fact. producers do generally pass along tax increases so long as all of them face them. if some do not, then yes, price is constrained, but if they all face it, then investment drops and takes supply down. marginal producers who were near break even exit. supply drops until the exogenous event is priced in. also, grain is a commodity. iphones are not. apple is a price setter, not a price taker. sure, they face some constraints, but they have a great deal of leeway. this sort of thing happens all the time. in san francisco, we passed an ordinance requiring restaurants to provide healthcare for all their employees. it resulted in a jump in prices. a surcharge for it is itemized on many restaurant bills. others just tacked a couple dollars onto every dish. this drove a number of restaurants who could not pass on pricing out of business. this has driven up prices further. Both textbooks said the same thing the professors said. And yes it sounded very strange to me at the time. I now do agree with it. The degree to which producers pass along cost increases depends on the price elasticity of demand for the product. I stand by my corn example (the tax does not hit all producers) but suppose the county also contains a price regulated electric power plant. They simply apply for a rate increase and pass all the tax on to the customer. The customer has no alternative. Your San Francisco restaurant story fits my thesis perfectly. The market price that maximizes profits turns out to be the price that minimizes the loss. The cost of production being below what the market will bear the firm exits the market. As an engineer in the auto industry I cannot refute that foreign competition has dramatically improved the quality and reliability of all vehicles sold in America. As a former engineer in the aerospace industry let be refute it for you. Note that I am not talking about luxury cars like Rolls-Royce and high end Mercedes cars here. There were very few foreign cars imported into the US before World War II. After the war they began to appear. They appealed because they were cheap, fun to drive, and got great gas mileage. They were cheap because they were produced with very cheap labor in war damaged countries and they were small. They were small because gas was very expensive. Last week in Europe the cheapest gas I saw was more than $5.50 a gallon. Engines were in the range of 25-60 horsepower. Performance was achieved with a lot of gears. European roads were mountainous and or full of curves. Cars designed for such roads corner well which makes them fun to drive. These imports did not appeal to most Americans. The main reason was that they were poorly made, unreliable, and required a lot of maintenance. I once got my feet wet as a passenger in a really cool British two seat sports car. The driver went through a puddle and water sprayed up through the floorboard. It was a new car. One of the best and more powerful was the VW bug which came with a 30 hp engine, no fuel gauge, and even though hydraulic valve lifters were nearly 30 years old it did not have them. In short in 1955 imports were unreliable 1939 technology filling a small but growing niche that domestic makers had ignored. By the late 1950s the segment had grown to the point that domestic makers decided to compete for it. The small cars they produced were head and shoulders better than the foreign competition. Among the domestic offerings was the Chevrolet Corvair which, despite what Ralph Nader said about it was one of the most innovative cars ever to come out of Detroit. The domestics took about half the market away from the imports. The Toyota offering the Toyopet and some other really bad cars were driven from the market. Two things happened because of this. Domestic makers proved that they could compete effectively with the imports but they could not make any money doing it. The cheap labor the imports had set the price too low. They abandoned the small car market. Second the imports licked the wounds and decided that their low labor cost advantage was wasted unless the improved quality and offered products more tuned to the market. The result was a death spiral for domestic makers. As imports got better all the domestics could do was reduce costs. That hurt quality. I owned a 1973 Ford Pinto station wagon and it was amazingly bad. My wife has never forgiven me for buying it. By the time Ronald Reagan was president the domestic industry was on the death bed. Reagan and government saved the industry just like Obama and government just did. Before free trade domestic car quality was superior to the imports. Exposed to cheap foreign labor quality declined. What else could happen? You really think we can pay domestic auto workers $2 a day? My conclusion is that foreign competition dramatically reduced quality and only with government aid have domestic cars managed to survive. Unless government bites the bullet and imposes tariffs I do not see how this industry survives. i think you are confusing price elasticity of demand and pricing power. grain has low elasticity, oil high, but as both are commodities, a marginal producer has no pricing power. an iphone is completely different. it's a differentiated offering. it is also available from only one producer. this gives them a great deal of pricing power. sure, it's bounded by other offerings. at a certain price differential, even a die hard apple fan might buy an android phone, but apple has significant ability to pass along costs. also note that if they are forced to produce domestically, so to will everyone else be. so everyone's cost goes up and constraints are lessened. i know they teach price = marginal cost, but that's under a heroic set of assumptions particularly costless entry and distribution which is clearly not true in cell phones. a quick look at apples income statement will make the difference between reality and perfect competition models exceedingly evident. if the costs to a whole industry go up because they have to manufacture here or face taxes and tariffs, price will go up. look at sugar for a truly egregious example (and that's a commodity). look at defense contractors for one more akin to apple. how do you figure that san francisco restaurants passing along increased costs to their customers fits your thesis. it seems to be the opposite of what you were claiming. 95%+ of SF restaurants successfully did this. it's now more expensive to eat here. that's pricing power: prices rose to reflect higher costs. if it were just a demand elasticity issue, why didn't they raise prices before? regarding the cars, quality of the US fleet is much higher than it was. if our manufacturers cannot compete, who cares? there is not a new american car i'd even think of driving. we got bled to death by the UAW. if at least one of the big 3 had been allowed to go into richly deserved bankruptcy, the other 2 would gain share and do better. that's life in the capitalist jungle. adapt or die. overpay your bloated workforce and others will come and take your customers with less costly options and better cars. it was not our engineering that failed. it was our business sense. Anonymous 7:13: your facts are more or less correct, but your application is wrong. GM, Ford and Chrysler have a long sad history of poor reliability and quality. Toyota and Honda raised the bar in quality and reliability (they are different) in order to compete in this market. The results are not disputable: better cars. Think of it in is way, if your car was built from 1995 on, there is a good chance it doesn't leak oil, or hasn't needed a muffler, when was the last time your replaced a battery? Batteries used to last 3-4 years, tops. I was able to get 6.5 years out of mine. (Although there have been some well publicized issues regarding head gaskets...mostly due to the migration to aluminum in engines.) Cars used to be rusting piles of junk after 5 years, not anymore. Where I would have agreed with you is with regard to technology integration. The emphasis on the line workers, thanks to he UAW, had major effects on engineering disciplines at the domestic OEMs. Especially in the late 90s through 2003. About that time, the companies realized they'd made some major miscalculations. Regardless, the improvement in overal vehicle is startling. I wouldn't count the industry out yet, but it still has a major battle left with labor. The battle was delayed due to the Obamacrats, but it will happen eventually. "My conclusion is that foreign competition dramatically reduced quality and only with government aid have domestic cars managed to survive. Unless government bites the bullet and imposes tariffs I do not see how this industry survives." You're kidding, right? The quality of cars both foreign and domestic has improved dramatically in recent decades, and the improvement in domestic cars has been driven by the foreign competition. Without it, domestic cars would be the same junk they were in the 60s and 70s. Do you remember that these cars needed to be worked on constantly to keep them on the road? That's no longer true. If domestic automakers can't compete, they shouldn't survive. morganovich said: - "in san francisco, we passed an ordinance requiring restaurants to provide healthcare for all their employees. it resulted in a jump in prices. a surcharge for it is itemized on many restaurant bills." If I were one of those restaurant owners, I might show it prominently on the menu as well, so customers would be reminded ofwhy their bill is now higher. markets in everything: iphone antenna solutions! To whoever said the cost of the iPhone would raise to $800-$3000 if the assembly was moved to the US is crazy. First the cost of assembly is $6. So if the assembly were moved to the US and that cost could rise 10 fold, it would be $60. That would cut the profit to Apple to $300 from $360. That would still leave Apple with a 50% gross profit margin. Even if they passed all that cost to the consumer, the iPhone price would only rise to around $650. So for an increase of around $50-$60, the iPhone can proudly where the "Made in USA" tag. I think that would drive even more US consumers to purchase and support Apple. Why Is This Simple Grammar Rule SO Difficult?